SYDNEY: Sydney audiences will have a unique opportunity to see Intent To Destroy - the Armenian Genocide documentary filmed during the production of The Promise - as part of the Armenian Film Festival, proudly brought to you by Hamazkaine, which begins this Friday 18th August 2017. 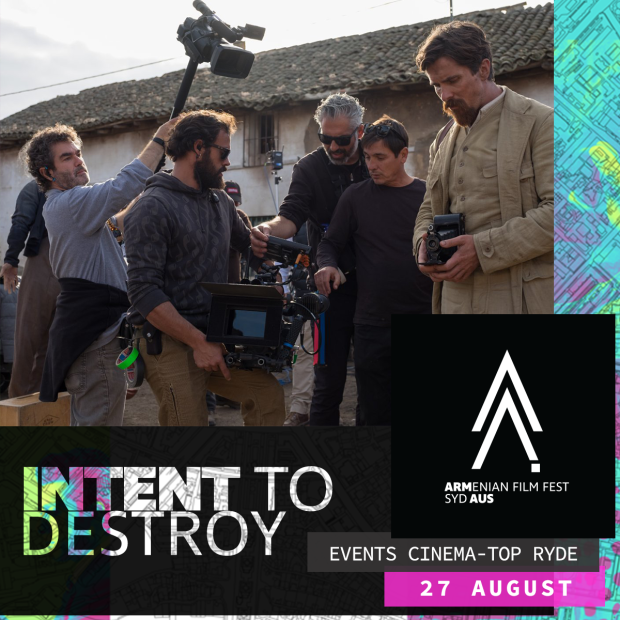 The Intent to Destroy screening, which is being co-hosted by the Armenian National Committee of Australia (ANC-AU), will close the Armenian Film Festival on Sunday, 27th August at 6pm. All films are being screened at Event Cinemas in Top Ryde. Filmed on the set of Armenian Genocide epic, The Promise, this documentary by Joe Berlinger looks at the difficulties experienced by the producers, cast and crew of the film starring Christian Bale, Oscar Isaac and Charlotte Le Bon. "Legendary documentarian Berlinger’s (Metallica: Some Kind of Monster, Tony Robbins: I am Not Your Guru, Crude) thirteenth feature film, captures the cinematic and political challenges of producing a historically meaningful, big-budget film in an environment rife with political suppression." "In 2015, Academy Award-winning director Terry George (Hotel Rwanda) took on the challenge of making the first mainstream film about the 1915 Armenian Genocide that wiped out 1.5 million Armenians in The Promise (starring Oscar Isaac and Christian Bale). Berlinger’s film combines a mixture of exclusive behind-the- scenes footage, rare archival material and investigative interviews that capture the shocking and complex history of the Armenian Genocide, all while presenting the unfolding, real-time drama of bringing this long-ignored chapter of human cruelty to the big screen." For tickets to Intent To Destroy, click here. The Armenian Film Festival, Sydney will be screening an unprecedented 16 films over 10 days. Among the films are several which capture stories relating to the Armenian Genocide and the Artsakh War. These titles include Roots, Kyank U Kriv (1 & 2), Don't Tell Me The Boy Was Mad, The Other Side of Home, Lost Birds, and of course, Intent To Destroy. Please click here for more details of all films, including ticketing information.